Yale celebrates its victory in the 150th Harvard-Yale Regatta on the Thames River in Gales Ferry, Conn.
NEW LONDON, Conn. — It was the equivalent of an oncourt basketball celebration or a mosh pit at home plate after a walkoff baseball win. But this being rowing, 16 members of the Yale men’s team impulsively did what made the most sense: They peeled off their shirts, dove into the Thames River from a large rented yacht, and deliriously swam toward nine teammates who had just delivered a stunning victory over rival Harvard in the 150th staging of the famed Boat Race. The special delivery — beer for the rowers, bottle of champagne for the coxswain — was quickly consumed. But the significance of the achievement, considering the historical milestone of the country’s oldest intercollegiate athletic event and Harvard’s recent dominance in the series, long will be savored by the Bulldogs. Exhausted from their 4-mile journey Sunday, the nine men in the Yale boat made the most noise when informed that they had smashed the upstream course record. By pulling their way from start to finish in 18 minutes, 35.8 seconds, the Bulldogs finished more than 16 seconds ahead of the Crimson (18:52.5), and took more than 6 seconds off what had been the upstream mark, set by Harvard in 1995. It also ended a run of Harvard wins in this event. There had been seven straight victories by the Crimson dating to 2007, 14 of the past 15, and 27 of the past 30. 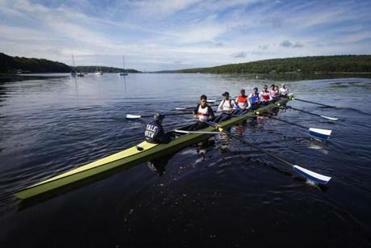 No Yale heavyweight crew had knocked off Harvard by such a wide margin since 1983, when the Bulldogs won by 18 seconds. The Red Top retreat in Connecticut is a very special place for Harvard rowers, especially this year. Yale had knocked off Harvard three weeks ago in winning the Eastern Sprints, but it was the Crimson advancing to the grand final, not the Bulldogs, two weeks later at the IRA National Championship. Unlike many of the previous races in this series — Harvard won by an average of 21 seconds in their 14 victories since 2000 — Sunday’s duel from Gold Star Bridge to Bartlett’s Cove was expected to be competitive. It was, briefly. But on a perfect day for racing, and the water in front of the two boats as quiet and as calm as a sleeping baby, Yale had the lead at the half-mile flag and never trailed. The margin was more than two lengths at the halfway point, prompting some in the Harvard boat to turn around and steal a look or two behind them, to see how much ground they’d have to make up. Too much, it turned out. Yale coach Steve Gladstone, who began his coaching career at Princeton in 1966, didn’t think his squad could go as fast as it did. “No, I didn’t. It’s 4 miles, we just have no idea. It’s really hard to predict what’s going to happen in that race,” said Gladstone, who will take two Yale boats to the Henley Royal Regatta later this month. “I think the margin of victory was a bit of a surprise. I can’t say that I saw this coming, necessarily. 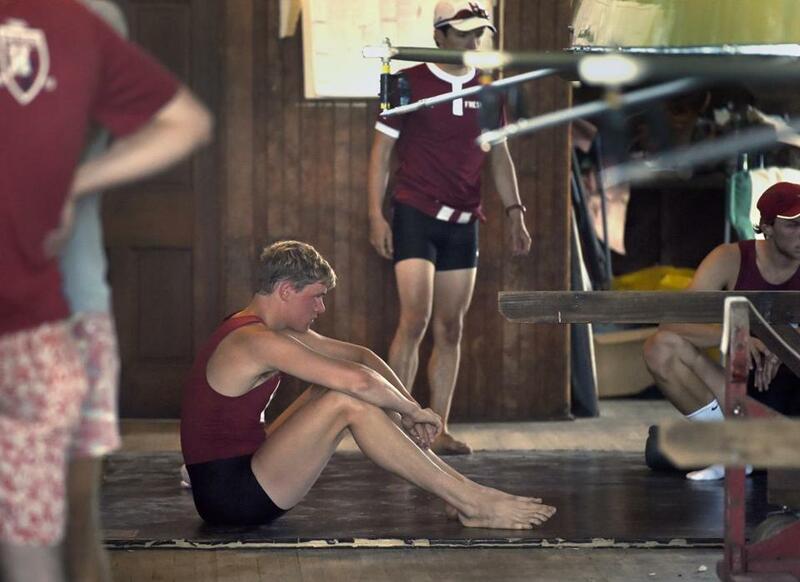 Harvard's Charles Risbey reacts after a loss to Yale in the 150th Harvard-Yale Regatta. Maybe to the Boat Race, too. Privately — he dared not speak it publicly, especially days before the race — Gladstone indicated that a Yale victory might come at an important time, with the recent series results leaning heavily in Harvard’s favor. The Crimson now lead, 95-55, but the best rivalries occur when each side gets to taste more than just an occasional victory. Still, it wasn’t a position the Crimson were familiar with. Yale also won the 2V race, by more than 4 seconds. Harvard claimed wins in the 3V race (also by more than 4 seconds) and in Saturday’s combination race. But Yale won when it mattered most, ending a long Boat Race losing streak in dominant fashion. It came without a senior in the boat, and on a historic day that recognized what began in 1852. It also stopped a run of crushing losses to Harvard, which beat Yale this season in football, then men’s basketball (play-in game for the NCAA Tournament), then a day later in men’s hockey (conference tournament quarterfinals). Finally on Sunday, a reason for the Bulldogs to celebrate. There were parties to throw in Bartlett’s Cove, and a certain rock that called for a new paint job. 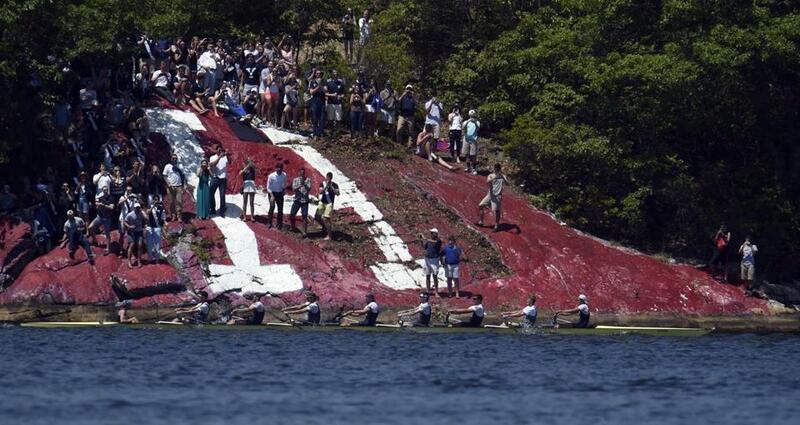 The Yale team passes by "The Rock" near the finish line of the 150th Harvard-Yale Regatta.